Unlike the rest of the tribes, the Levites were to live in towns scattered throughout the Promised Land where they could teach the people the law and apply it in local courts. Numbers 35:2-5 details the amount of pasture land each town should have. Measuring from the edge of town, the area for pasture was to extend outward a thousand cubits (about 1,500 feet) in each direction, east, south, west, and north. You shall measure, outside the town, for the east side two thousand cubits, for the south side two thousand cubits, for the west side two thousand cubits, and for the north side two thousand cubits, with the town in the middle (Num. 35:5). 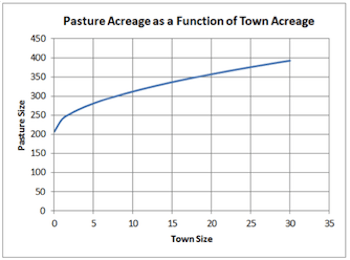 ​Mathematically, as the town grows, so does the area of its pasture land, but at a lower rate than the area of the inhabited town center. That means the population is growing faster than agricultural area. For this to continue, agricultural productivity per square meter must increase. Each herder must supply food to more people, freeing more of the population for industrial and service jobs. This is exactly what is required for economic and cultural development. To be sure, the town planning doesn’t cause productivity to increase, but it creates a social-economic structure adapted for rising productivity. It is a remarkably sophisticated example of civic policy creating conditions for sustainable economic growth. This passage in Numbers 35:5 illustrates again the detailed attention God pays to enabling human work that sustains people and creates economic well-being. If God troubles to instruct Moses on civic planning, based on semi-geometrical growth of pastureland, doesn’t it suggest that God’s people today should vigorously pursue all the professions, crafts, arts, academics, and other disciplines that sustain and prosper communities and nations? Perhaps churches and Christians could do more to encourage and celebrate its members’ excellence in all fields of endeavor. Perhaps Christian workers could do more to become excellent at our work as a way of serving our Lord. Is there any reason to believe that excellent city planning, economics, childcare, or customer service bring less glory to God than heartfelt worship, prayer, or Bible study? Jacob Milgrom, “Excursus 74: The Levitical Town: An Exercise in Realistic Planning,” JPS Torah Commentary: Numbers (The Jewish Publication Society, 1990), 502-4. Adopted by the Theology of Work Project Steering Committee November 1, 2013.